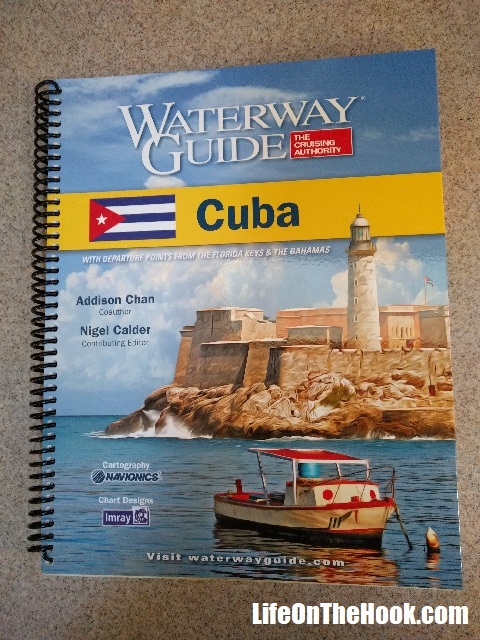 Before my recent injury, we’d ordered the new Waterway Guide to Cuba in order to start doing some detailed planning for our anticipated return there in February. We met the author, Addison Chan, at Marina Hemingway in Cuba last year, and we spent a couple of months buddy-boating with Addison and his wife Pat, traveling together from Cuba to Mexico and then to the Florida Keys. We didn’t know it at the time, but Addison was doing research for the guide as we traveled along the northwest Cuban coast toward Mexico. 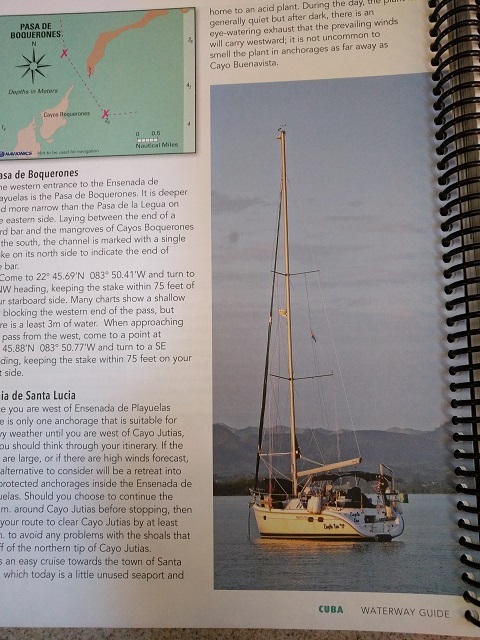 The chances of our returning to Cuba this year are now looking pretty slim, but since I have some time on my hands while I recuperate, I’ve been browsing through the Cuba Waterway Guide. So imagine our surprise and delight when we realized that Eagle Too makes two appearances in the book! More than just a cool reminder of our trip, I think this will also give us something to point to if the USCG ever questions our claim that we travel to Cuba under the Journalism license, doing research for a cruising guide to Cuba’s north coast. This entry was posted in Where? and tagged Cruising Cuba, Cuba Cruising Guide on January 14, 2018 by Robert. “Really?” I said, with a “So that’s how it’s going to be” tone. “Sorry, but we get asked that a lot. We don’t have any water.” At least she was smiling, so I think it was intended to be a lighthearted moment. And a little while later, there I was in the ER treatment room, Rhonda by my side, as the doctor looked at my X-rays. “You’re going to need surgery,” he said. “It’s not just dislocated?” I asked with resignation. “Lateral fracture of the patella,” he explained, showing me in the X-ray image where what should have been one bone was now two distinct pieces. “By the way, that was pretty badass, pushing your kneecap back into place,” he added. He said he’d worked with hockey teams quite a bit, had seen similar injuries, but couldn’t recall a time where the patient was able to relocate the broken bone himself. “Kudos,” he added. The hospital arranged a consult with an orthopedic surgeon for the next day, but since my condition wasn’t severe enough to admit me, they gave me a leg brace, a pair of crutches, and a prescription for pain meds, and showed me the door. Unfortunately, in my current condition, there was no way I would be able to climb back onboard Eagle Too. We had to book a hotel room for the duration. The next day, at the surgeon’s office, the doctor explained that the lower third of my kneecap was mush and unsalvageable, but the top two thirds looked pretty good. In my current state, my patellar tendon, which is what moves the lower leg, wasn’t connected to anything, which explained why I had no ability to lift or straighten it. But he felt pretty confident he’d be able to reattach the tendon to what remained of my kneecap, restoring normal leg function. A few weeks of recovery and a few months of physical therapy and I should be, if not quite as good as new, at least able to return to my normal range of activities. He scheduled the surgery for the next day. We’d never used Uber before. It actually works really well. Until now Rhonda had been able to borrow a car from some friends in the marina (thanks Mike and Jen!) to transport me around. But they had plans today, so we took an Uber to the surgery center. I can see why the service has become so popular. Once you set the app up on your phone and enter your payment method, then you just type in where you need to go, and in minutes a car pulls up to take you there. No cash is required, as the payment is handled by the app. I guess if there’s one small bright spot in all this, it’s that we’ve learned a new way to get around. The surgery went well. The doctor said I could walk on the leg while I was recovering, and that he’d see me in 12 days to take off the leg brace and unwrap everything. If it all looked good, I could then start physical therapy. We stayed in a hotel for five nights, but I wanted to get back onboard Eagle Too as soon as possible. Not only is she our home, but the hotel bill was eating us alive. With Rhonda’s help and the assistance of friends in the marina I finally stepped back onboard five days after the accident. With a few minor bumps, each day since has been better than the one before. I’m eight days post-surgery now, and while I still have a cage on my leg and a bandage from my ankle to my thigh, I’m feeling pretty good. I’ve been completely off pain meds for over 36 hours, and I can lift and walk on the leg with little pain. Rhonda has been taking very good care of me, and I’m quite fortunate to have such a capable partner. I can’t imagine what dealing with something like this would be like for a single-hander who doesn’t have someone to prepare meals and dispense meds and take care of all those little boat chores that still need doing like filling the water tank and adjusting the lines. Thank you for being there for me, dear! So that’s where things stand as of today. I have my follow-up appointment next week, and I’m pretty sure it will go just fine. With Rhonda’s help I was able to get off the boat and take a short walk on the pier yesterday. Today we did it again and I went at least twice as far. Hopefully before long my range will increase from just a brief stroll on the pier to being able to make it the three or four blocks into town so we can take in a few movies at the AMC or grab lunch someplace. It will probably be a while before I can get on a bike again though. It’s still too early to tell what comes next for us. We’ll most likely call off the rest of this cruising season and return to Pensacola in a few months so that I can finish rehab at home. With luck, by spring this will all be just an unpleasant memory and we’ll be ready to head south again next fall. 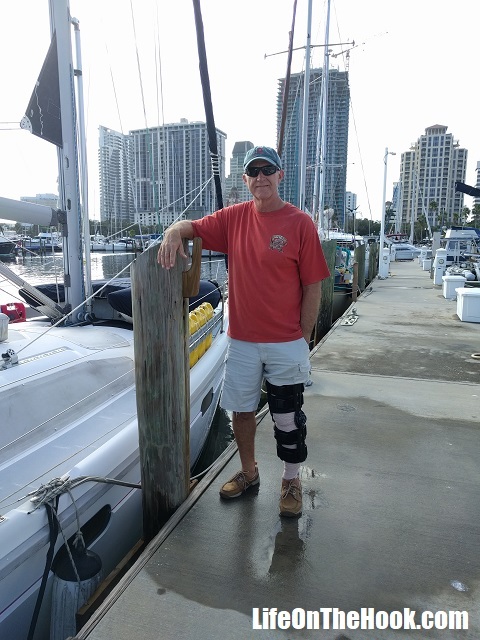 There is even a (remote, but not impossible) chance that if my leg heals enough in the next four to six weeks, we might be able to salvage at least a few months of the season, possibly traveling down to the Keys. We’ll see. 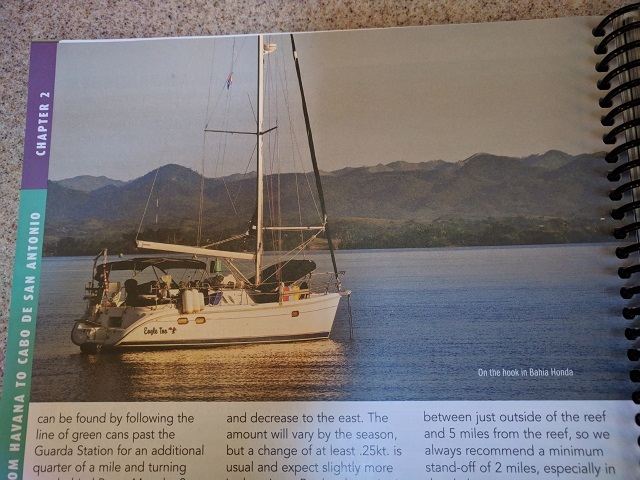 I’d just need to feel confident in my ability to do things like get in and out of the dinghy, climb the stern boarding ladder or stand on the foredeck and work the anchor windlass without my left knee folding up. I do know one thing though. If I ever decide to move forward with that cruising guide I’m considering writing, I’ll be able to approach the chapter on “Dealing with Medical Emergencies” from a position of firsthand experience! This entry was posted in What? and tagged Dealing with injuries while cruising on January 12, 2018 by Robert. Eagle Too tugged at her lines, dancing and swaying at the dock as she was buffeted by strong north winds. Rhonda and I slept fitfully, our rest constantly interrupted by sudden jerks and shudders. In the early AM, we simultaneously awoke, both realizing that the boat didn’t feel right. She had a pronounced list (lean) to port, and the boat wasn’t rolling back to level as she should. Something was wrong. And I had a pretty good idea what it was. The full moon (the Wolf Moon) had shown brightly and clearly in the sky when we had gone to bed the previous evening. A full moon makes for spring tides (which has nothing to do with the season), with higher highs and lower lows than are typical. The strong north wind that had been blowing since the passage of a recent cold front had pushed an enormous amount of water out of Tampa Bay. Taken together, the result was an extreme minus tide. Poking my head up the companionway, I could see that Eagle Too was sitting almost four feet below the dock. We’d been here at the St Petersburg Municipal Marina for over six weeks, and we’d “dialed in” our lines and fender board so our boat rose and fell to the tides with no adjustments necessary. But this super-low tide had us hanging from our lines, which had drawn up as tight as guitar strings, causing the boat to roll to port. I had to go ashore and loosen them to relieve the pressure or risk tearing out our deck cleats. As I stood on deck, the dock was at about the level of my upper stomach. Placing my hands on the dock, I jumped up and got a knee on top of it while doing a pushup, easily scrambling up off the boat. Loosening the lines to take the pressure off our cleats, Eagle Too settled down into the water and rolled back to level. Job accomplished, all I wanted was to return aboard and crawl back into our still warm bed. Because the lines were now loosened, Eagle Too was not only almost four feet below me, but the north wind had also pushed it about 2 feet away from the dock. It seemed like the best way to get back aboard was to sit on the edge of the dock with my legs dangling over the side while Rhonda, who was still aboard, pulled the lines to try and pull the boat closer to the dock. She pulled the boat in as close as she was able, and then released the line and moved aside so I could jump back aboard. I swung my legs out in front of me, pushed off the dock with both arms, and launched myself in an arc toward what I thought was going to be a graceful landing onboard. Maybe it was because the boat started drifting away as soon as Rhonda released the line, or maybe it was because the graceful arcing leap my youthful feeling brain attempted to perform was poorly executed by my not-so-youthful 59 year old body. But rather than both feet landing squarely on the deck as planned, I just barely caught the edge of the boat with the tips of my toes. Down I went, falling along the side of the boat, eventually catching myself with my elbows and preventing a fall into the frigid water. A quick blast of pain told me I’d banged my left knee on the toerail of the boat as I slid down the side. But my first concern was to get myself back onboard. Pushing myself upright and swinging my legs up over the side, I was able to clear the side of the boat, collapse onto the deck, and then crawl into the cockpit. I was relieved that I hadn’t gone swimming, and grateful that I hadn’t hit my jaw or head. We’ve known of others who had killed themselves in similar circumstances by hitting their heads, knocking themselves out and falling into the water and drowning. With time to now evaluate the situation, I took stock of my condition. My arms and shoulders were a little sore from where I’d fallen onto them, but everything still worked. My biggest problem was that my left leg was really starting to throb, and I couldn’t move it very much. I pulled up the leg of the sweatpants I’d donned to go topside, and the first thing I noticed was that my left kneecap was now on top of my thigh. “Well that can’t be good,” I thought. “Better put it back where it belongs.” I believed it was most likely dislocated, and pushing it back into place seemed like the right thing to do. So I put my left palm on the lump atop my thigh, placed my right hand over the left, and then gently walked my patella back to the front of my knee. I needed a couple of minutes to catch my breath after that, but then I took my leg in my hands and began slowly flexing the knee to make sure nothing else was broken while Rhonda went below to grab an ice pack. “OK, this is going to be fine,” I thought. “A few days of ice and compression and I’ll be good as new.” Just then one of the marina dock managers walked by, checking to see how boats were handling the low tide. “How’s it going?” he asked. A look of concern crossed his face. “Do you want me to call someone?” he asked. I started to say no, that I’d be fine. But I had enough presence of mind to realize that maybe I wasn’t. It probably wouldn’t hurt to get it checked out. So the marina called EMS. While waiting, the adrenaline starting subsiding, which had been hiding the pain. By the time EMS arrived, I realized asking for help had been the right call. The EMS crew agreed, and radioed the Fire Department. It was going to take a whole bunch of people to lift this 200 lb invalid up off the boat, onto a dock, and into a gurney. The day had started as just one of those days where life had tossed us a little challenge that we often encounter in our Life On The Hook™. But in the blink of an eye, everything had changed, and now I was taking my first ambulance ride. This entry was posted in What? 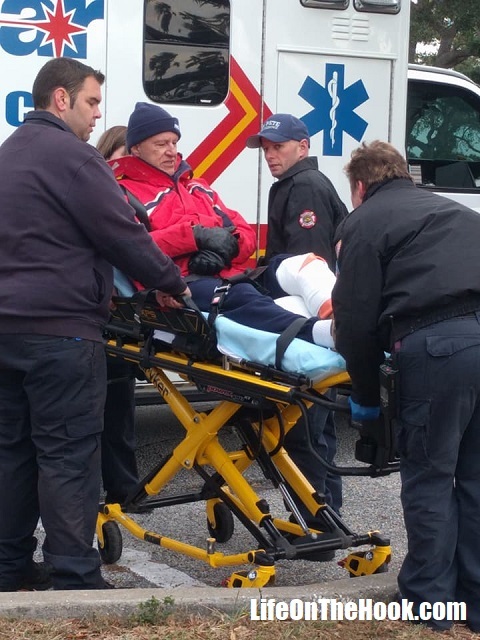 and tagged Dealing with injuries while cruising, Injured cruiser, Sailboat injury on January 10, 2018 by Robert.